After our quick overnight backpack of the Kenomee Loop, we had just a short drive to the location of the trail build. We were debating whether we could take the time to drive back to Bass River for coffee, when a sign on the side of the road caught our attention. Apparently this was the last weekend for the Glooscap Country Bazaar, and apparently it was a big deal. The parking lot was full and there were signs advertising baked goods among other things. We didn’t find coffee, but we did find coconut cream tarts, peanut butter fudge, green beans, and shell peas all for incredibly low prices, along with lots of local handcrafts that we didn’t have time to explore. The Bazaar has been successful run by volunteers for 38 years and counting… definitely worth checking out if you ever have the chance. No coffee, but we were happy enough to eat coconut cream tarts on the short drive to Thomas’ Cove, which was the location of a Trail Build / Appreciation Day hosted by the Kenomee Trail Society. 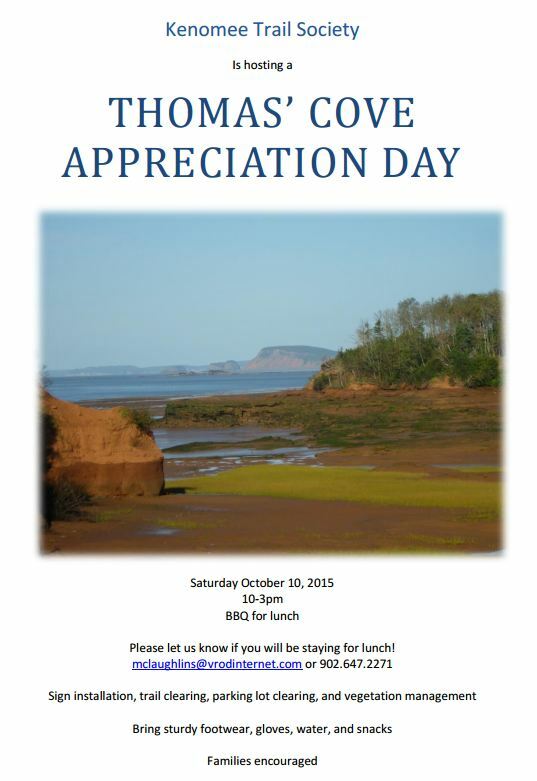 Thomas’ Cove is actually a Coastal Reserve with 8km of trails. We hadn’t even heard of it before this event, though “apparently” they have the best coastal views in Nova Scotia. We say “apparently” because we didn’t actually get to see the views on this day. There was a good turnout for the trail build, and as the chores were divided, we ended up in the “boardwalk crew”. Other groups were replacing signs, trimming overgrown brush, removing fallen trees, relocating sections of the trail that had experienced erosion, and doing some maintenance in the parking area, along with numerous other tasks. Our job was securing chicken wire over the top of boardwalks that had become slippery over time. Preparing to staple down the chicken wire over the slippery boardwalk. The boardwalks are located on inland forested parts of the trail. The plan was for everyone to walk the entire trail system after the work was done, but we had commitments for later that day and by the time we ran out of staples, we had also run out of time on the clock. So, hiking the rest of the Thomas’ Cove trails moves to the top of our list for next time we are in the area! As a final bonus, Heather was lucky enough to win one of the “door prizes” – a gift certificate for a gouda wheel donated from That Dutchman’s Cheese Farm. Although we were in a rush, the farm was right on our way so we were able to stop off and choose a flavour. After a lot of sampling, we picked their pepper mix and it was delightful! As an aside, the location is amazing with an animal and nature park in addition to the cheese factory. It also goes on the list for a repeat visit. A word of encouragement to any hiking enthusiasts who have the chance to participate in an event like this – it’s a great opportunity not just to give something back, but to learn about what goes into building and maintaining successful trail systems over time. Plus if you’re extra lucky, you will get fed a great BBQ lunch like we did! Thanks to the Kenomee Trail Society for a fun few days!